Begin by spraying a nonstick pan with nonstick cooking spray or coconut oil and turning burner to low/medium heat. Next, in a medium size bowl, mash your banana until it is smooth (you are more than welcome to do this entire process in a food processor). Next, add in 2 large eggs and whisk until completely combined. Finally, add in 2 tablespoons of peanut flour and whisk until combined and the batter is smooth. Spoon about 2 tablespoons of pancake onto the stove top (the batter should be a little thinner than normal pancake batter). Let cook for about a minute or so, and then carefully flip. Let the second side cook for an additional minute. *Note: these pancakes will be small. To make the peanut flour sauce, mix together about a tablespoon of peanut flour with about 1.5 tablespoons of almond milk. You should get a thick saucy consistency. 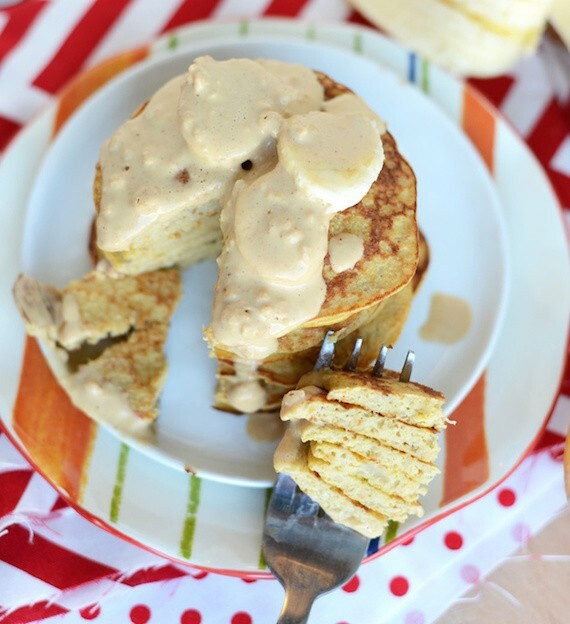 Pour on top of pancakes and eat!